Acronis Backup Desktop provides a local cloud backup and recovery solution. It enables a best-in-class solution that addresses your customers’ data protection needs and provides you with a solution that is easy, complete, and safe. The backup solution automatically backs up your data and offers unrivalled ease-of-management, with your data accessible anywhere, anytime. This gives you the peace of mind that comes with the knowledge that your data is safely stored at all times. The Acronis Backup Desktop solution has zero entry costs and a per-use business model. This eliminates any upfront investment so you can get to market quicker and grow your business. Ensure data protection for your customers with a comprehensive and secure cloud backup and recovery service. LuxCloud offers a one-stop shop for white label cloud business applications. Get a discount of 20% off the Suggested Retail Prices and start to resell cloud services today! Up to 3 rebrandable channel levels, unlimited tenants and all available features by Acronis AnyData Engine. 70% of SMBs don’t have sufficient protection for their critical data, creating an excellent market opportunity. Launch quickly with zero entry costs and a per-use business model. Local and cloud backup plus recovery combined into 1 simple solution, managed by all layers in the channel. Automates deployment and management of software functionalities using a central management console. Great for Sales and marketing collateral, joint marketing initiatives and training and certification. > How to sell cloud backup? The BackupAgentAcronis Backup Desktop Product Sheet provides information about product benefits, online backup features and target market information. How to sell online cloud backup? A short SlideShare guide about the benefits of online backup, key figures, opportunities and reasons for buying. Can I edit an already created backup plan in Acronis Backup Cloud? If you want to edit the backup plan for all machines to which it is applied, select one of these machines. Otherwise, select the machines for which you want to edit the backup plan. Select the backup plan that you want to edit. Click the gear icon next to the backup plan name, and then click Edit. To modify the plan parameters, click the corresponding section of the backup plan panel. To change the backup plan for all machines to which it is applied, click Apply the changes to this backup plan. Otherwise, click Create a new backup plan only for the selected resources. Can I start a backup manually (not during the scheduled time)? Select a machine that has at least one applied backup plan. If more than one backup plans are applied, select the backup plan. Click Run now on the backup plan panel. The backup progress is shown in the Status column for the machine. How can I encrypt my back up data in Acronis Backup Cloud? It is recommended that you encrypt all backups that are stored in the cloud storage, especially if your company is subject to regulatory compliance. IMPORTANT! There is no way to recover encrypted backups if you lose or forget the password. To enable encryption, specify the encryption settings when creating a backup plan. After a backup plan is applied, the encryption settings cannot be modified. To use different encryption settings, create a new backup plan. On the backup plan panel, click Encryption. Specify and confirm the encryption password. AES 128 – the backups will be encrypted by using the Advanced Encryption Standard (AES) algorithm with a 128-bit key. AES 192 – the backups will be encrypted by using the AES algorithm with a 192-bit key. AES 256 – the backups will be encrypted by using the AES algorithm with a 256-bit key. How can I recover files in Acronis Backup Cloud by using bootable media? For information on how to create bootable media, refer to the FAQ "How to create bootable media in Acronis Backup Cloud?" Boot the target machine, by using the bootable media. Click Manage this machine locally or click Rescue Bootable Media twice, depending on the media type you are using. On the welcome screen, click Recover. Click Select data, and then click Browse. To recover from cloud storage, select Cloud storage. Enter the credentials of the account to which the backed up machine is assigned. To recover from a local or a network folder, browse to the folder under Local folders or Network folders. Select the backup from which you want to recover the data. If prompted, type the password for the backup. In Backup contents, select Folders/files. Select the data that you want to recover. Click OK to confirm your selection. Under Where to recover, specify a folder. Optionally, you can prohibit overwriting of newer versions of files or exclude some files from recovery. [Optional] Click Recovery options to specify additional settings. Click OK to start the recovery. What can I do if I forget the Encryption password for Acronis Backup Cloud? Please note, that there is no way to recover encrypted backups if you lose or forget the password. It is impossible to restore the password, or reset it. How to create bootable media in Acronis Backup Cloud? Bootable media is a CD, DVD, USB flash drive, or other removable media that enables you to run the agent without the help of an operating system. The main purpose of bootable media is to recover an operating system that cannot start. We highly recommend that you create and test a bootable media as soon as you start using disk-level backup. Also, it is a good practice to re-create the media after each major update of the backup agent. You can recover either Windows or Linux by using the same media. To recover OS X, create a separate media on a machine running OS X.
Download the bootable media ISO file. To download the file, select a machine, and then click Recover > More ways to recover... > Download ISO image. Burn a CD/DVD using the ISO file. Create a bootable USB flash drive by using the ISO file and one of the free tools available online. NOTE: Use ISO to USB or RUFUS if you need to boot an UEFI machine, Win32DiskImager for a BIOS machine. In Linux, using the dd utility makes sense. Connect the ISO file as a CD/DVD drive to the virtual machine that you want to recover. On a machine where Agent for Mac is installed, click Rescue Media Builder on the Applications menu. The software displays the connected removable media. Select the one that you want to make bootable. WARNING! All data on the disk will be erased. Wait while the software creates the bootable media. How can I download files from the cloud storage in Acronis? Select the machine that was backed up. Click Recover > More ways to recover... > Download files. Enter the credentials of the account to which the backed up machine is assigned. When browsing disk-level backups: Under Versions, click the backup from which you want to recover the files. When browsing file-level backups: You can select the backup date and time in the next step, under the gear icon located to the right of the selected file. By default, files are recovered from the latest backup. Browse to the required folder or use search to obtain the list of the required files and folders. Select the check boxes for the items you need to recover, and then click Download. If you select a single file, it will be downloaded as is. Otherwise, the selected data will be archived into a .zip file. Select the location to save the data to, and then click Save. How do I recover my folders / files using the Acronis web interface? Select the machine which originally contained the data that you want to recover. Select the recovery point. Recovery points are filtered by location. Select the files that you want to recover. Select the recovery destination. You can select the original location or any local or network folder. Files from virtual machines are recovered to the machine where Agent for VMware or Agent for Hyper-V is installed. If you select Original location, the software will reproduce the original path on this machine. If you select a network folder, it must be accessible from that machine. The recovery progress is shown in the Status column for the machine. What browsers are supported by Acronis Backup web interface? In other web browsers (including Safari browsers running in other operating systems), the user interface might be displayed incorrectly, or some functions may be unavailable. How can I delete all backups of a machine from a given location? Select a machine whose backups you want to delete. Select the location to delete the backups from. How can I revoke a backup plan from machines? Select the machines that you want to revoke the backup plan from. If several backup plans are applied to the machines, select the backup plan that you want to revoke. Click the gear icon next to the backup plan name, and then click Revoke. 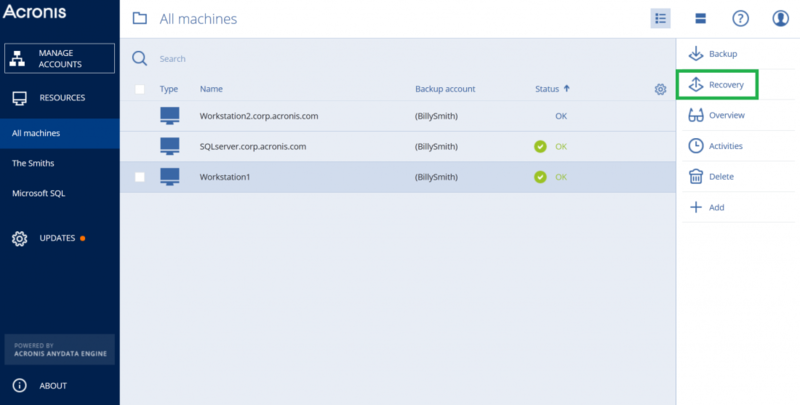 How can I delete a backup plan in Acronis Backup Cloud? Select any machine to which the backup plan that you want to delete is applied. If several backup plans are applied to the machine, select the backup plan that you want to delete. Click the gear icon next to the backup plan name, and then click Delete. As a result, the backup plan is revoked from all of the machines and completely removed from the web interface. For the general FAQ, click here. Looking for a server backup solution?